It has been revealed that Arsenal boss Arsene Wenger has heaped praise on two-goal Aaron Ramsey after their 3-0 win at Cardiff City. The French tactician claimed £50million would not be enough to tempt him to sell the Welshman. Wenger said : “No. We don’t want to sell anybody, we want to keep the team together. I’ve suffered enough for years for having to sell the players. 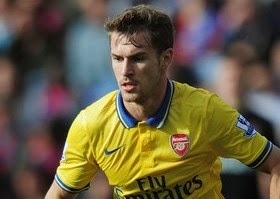 Wenger also believes Ramsey can get even better. “He keeps surprising me,” said the Gunners’ boss. “He has matured as a player and a person as well. We came here in the FA Cup a few years ago and he had a very difficult game. Now he shows how much he has developed as a person. “I was a midfielder and I would have loved to have what he has. “He can defend, attack and score goals. What more do you want? He is also young – another quality that I have lost. “He can still develop. When you see the improvement in him in the last two years then why should he stop now?